BRANDON, Man. 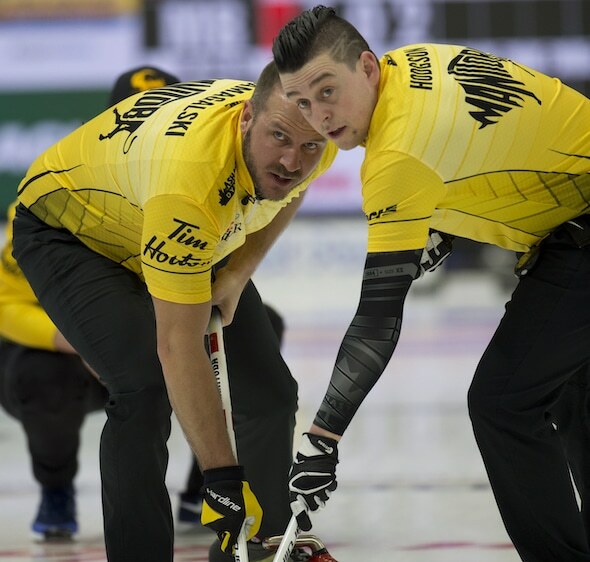 – Mike McEwen and Team Manitoba righted its shaky ship while Brad Jacobs and Team Northern Ontario continued to cruise along Tuesday morning at the Tim Hortons Brier, presented by AGI. After two demoralizing 10th-end losses, McEwen and his Manitoba (3-2 West St. Paul) mates – third Reid Carruthers, second Derek Samagalski, lead Colin Hodgson, alternate Matt Wozniak and coach Rob Meakin – jumped into an early 6-1 lead and rolled to a 13-4 win over Andrew Symonds and Team Newfoundland and Labrador (0-5, St. John’s). “That felt better,” McEwen said. “We’ve still got some sloppy parts here and there, but it was pretty good. Drew well, really good touch game from the guys. McEwen will play the unbeaten Jacobs foursome in the Tuesday evening draw. Jacobs and Team Northern Ontario (5-0, Sault Ste. 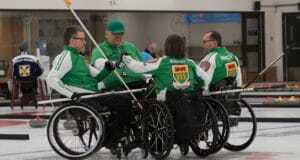 Marie) assured themselves of advancing into the Championship Pool with a 7-5 win over Kirk Muyres and Team Saskatchewan (3-2, Saskatoon). The top four teams in each of the two pools advance to the Championship Pool that begins play on Thursday. Jacobs, the 2013 Tim Hortons Brier champion and 2014 Olympic gold medallist, used the hammer to get two in the first end. 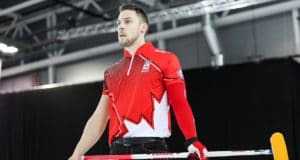 The teams forced each other into singles in the second and third thanks to key double take-outs, by Northern Ontario third Ryan Fry in the second and Muyres in the third. Jacobs, Fry, second E.J. Harnden, lead Ryan Harnden, alternate Lee Toner and coach Adam Kingsbury, were up 4-3 until they broke the game open with three in the seventh. Still, they were taken to 10 ends for the first time. “It’s good to get into some tight games,” said E.J. Harnden. “We expect to be in many more so to go 10 ends is good for our team and to get the result, so we’re happy about that. Today was a good test for us and to feel what a tight game is going to feel like … and we handled it well and able to break it open late. Martin Crête and Team Quebec (2-3, Saint-Romuald) scored three in the first end and went on to beat John Likely and Team P.E.I. (1-4, Charlottetown) 8-5 and Brendan Bottcher and Team Wild Card (4-1, Edmonton) scored six in the fourth end and roll past Jon Solberg and Team Yukon (2-3, Whitehorse) 10-3.